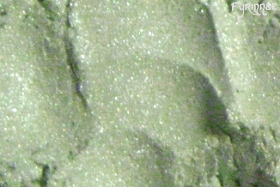 Satiny pale white-green in the jar, but once applied, it has an iridescent glow of light green shimmer. Try applying over a black base (shadow, liner, etc) for a great effect. For a similar glowing green shade but with less white effect, try Rainier. Swatch applied over bare skin. Over primer or a base, it will be more "glowy" and less sheer.